Ugly Sweater Contest for a Good Cause! Wear the ugliest sweater to win! ALL PROCEEDS GO TO THE SHOP WITH A COP FOUNDATION!!! Who doesn’t like an ugly sweater?? So help out and have a fun time wearing your ugly sweater to win! WINNER gets a $5.00 Walmart Gift Card! One winner from each grade!! Buy a ticket from Ms. Smith or Mr. Wollesen. 18 Students Selected to be Published! 18 students have been selected to be published in the prestigious annual student anthology, Award-Winning Young Writers of America – 2016-2017! Last month, three class sections of 7/8th graders did a poetry composition project in Ms. Smith's Language Arts class. They entered their best poems in the Young Writers of America Student Poetry Contest, a free, annual, nation-wide competition. The panel of educators reviewed thousands of submissions entered in the 2016-2017 Young Writers of America Student Poetry Contest. Less than 20% of total entries were selected for publication! These students received a “Congratulations Letter & Envelope”, and letters have been distributed for students to bring home to their parents explaining details. For more information, or to order a copy of the book, please visit https://www.youngwriterscontest.com. Below is the schedule for the CMS ASP for the rest of the quarter and the start up day in January. CMS had another successful holiday food drive! 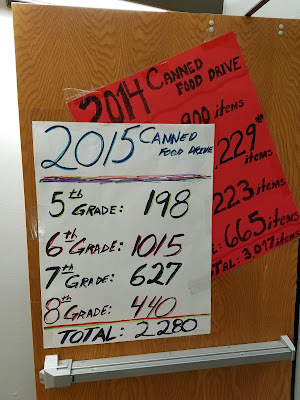 The 6th grade class collected the most non-perishable food items with 1096. 5th grade edged out the 7th grade for 2nd place by three cans and the 8th grade class took 4th place. 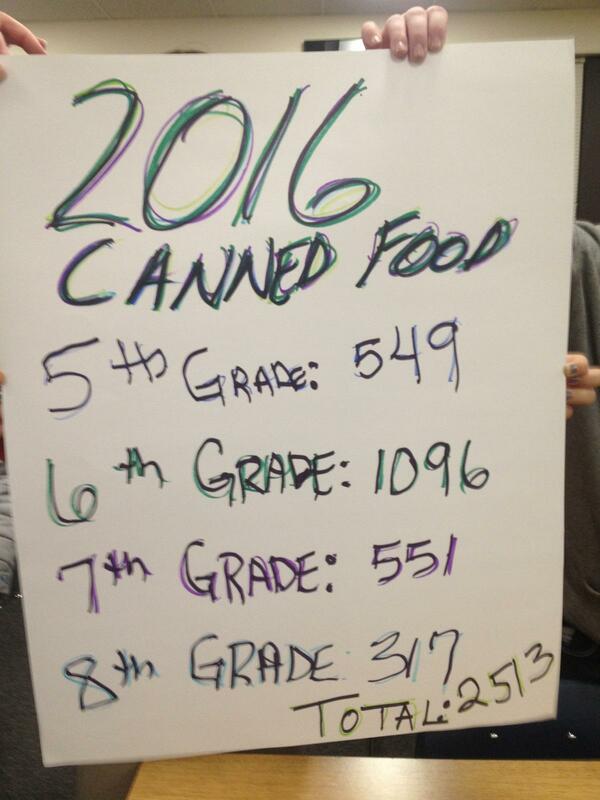 Thank you to all of the students, families, community members and businesses that donated to our food drive effort! 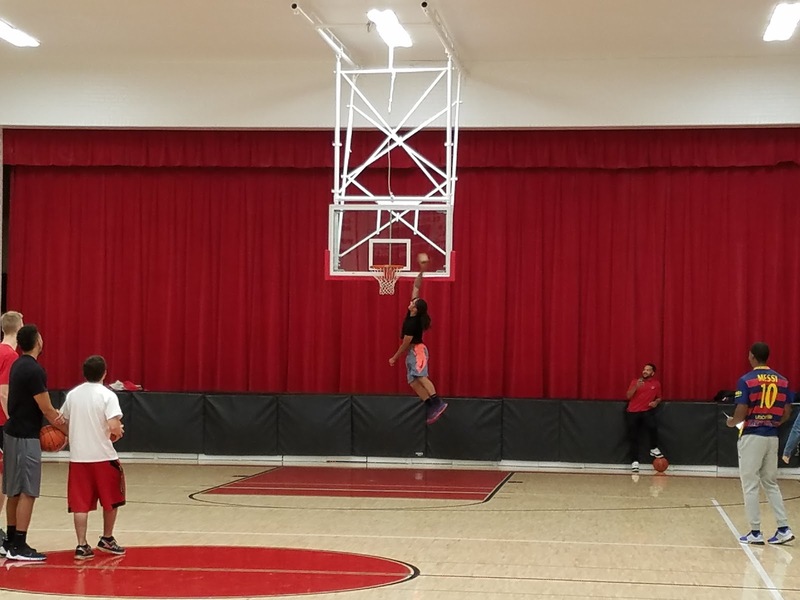 CMS will celebrate the student's efforts on December 21st with our annual "Nothing but Net" games. Students will go to the gym at 12:25 for end of quarter awards and then the 6th grade class will compete against the faculty in ping-pong, basketball, volleyball and deck tennis. Parents are welcomed to join in the fun! Winter Choir Concerts will be next Thursday! 5th-6th Grade @ 6:00 & 7th-12th@ 7:00. Come enjoy some holiday music and share in the joy of the season. 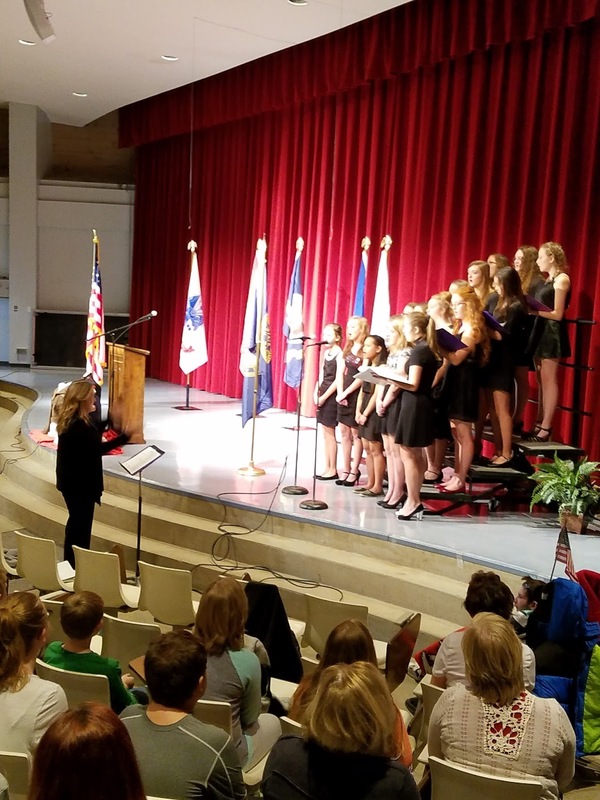 Chadron Middle School will hold a 5th grade parent meeting immediately following the 5th/6th grade Choir Concert on December 15th in the Chadron High School library. The purpose of the meeting is to discuss the 5th grade band class that students will take during the 2nd semester of the school year. Topics of discussion will include: class goals, instrument rentals and supplies that students will need to participate in band. Mr. Rischling will also answer any questions that you have regarding the class. We are looking forward to having our 5th grade students participate in band! This is the second year that CMS 5th graders have had this opportunity and we hope that having both a choir and band experience will enable them to make an informed decision when choosing which music class to pursue next year. We appreciate feedback from students and parents so that we can make adjustments in our future planning. If you are unable to attend the meeting on December 15th, please contact Mr. Dressel so that he can get you the information. Thank you, and we look forward to seeing you at the 5th/6th grade choir concert at 6 PM on December 15th. Riley's NRD Poster Wins State! Congratulations to Riley A. for winning the 7th-9th grade State NRD Poster Contest! His poster is headed to Nationals! Chadron Middle School is planning a Parents as Partners meeting on December 7th at 5:30 PM in the CMS library. CMS staff, public library staff, and UNL Extension have also been invited to attend. 1. Enhance parents' voices and engagement at CMS. 2. Develop strategies to: "witness the good" in our students, grow leadership opportunities for students and parents, enhance school/parent/community communication, identify barriers to better partnerships with school/parent/community and ideas to overcome them. 3. Develop a core parent advisory team to disaggregate data from the meeting and help plan next steps. 5:45 - World Cafe Discussion - What do we want our school/community culture to be? I'm looking forward to this meeting and I hope that you are able to attend. 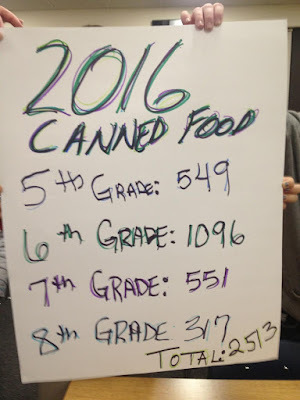 The Chadron Middle School Student Council kicked off the 2016 Caring for Sharing Food Drive on November 28th. 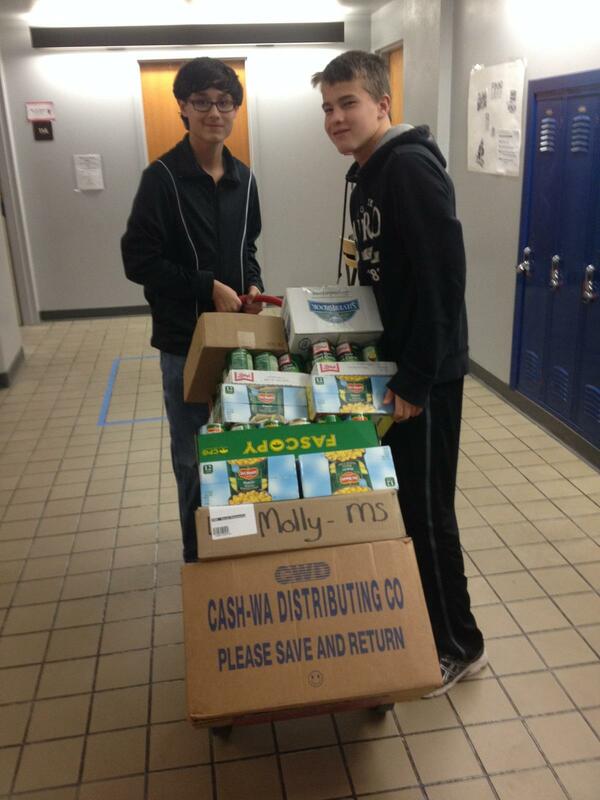 Students are encouraged to bring non-perishable food items to school through December 13th. All of the collected food items will be donated to the Shepard's Pantry at the Chadron Immanuel Lutheran Church. As in years past, the Caring for Sharing Food Drive is a grade level competition. The grade that collects the most non-perishable food items will compete against the staff in the "Nothing But Net" games on December 21st, which is the last day of school for the semester. This has been a really fun event that students and staff look forward to. Parents are welcomed to attend the games and we will also do end of the quarter student awards including Cardinal Effort and Perfect Attendance. 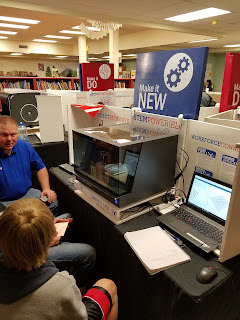 NPPD set up 11 Makerspace labs in the CMS library on 11/28. Mrs. Waugh's 4th block, 8th grade class was the first to try out the labs and it looked like a lot of fun! 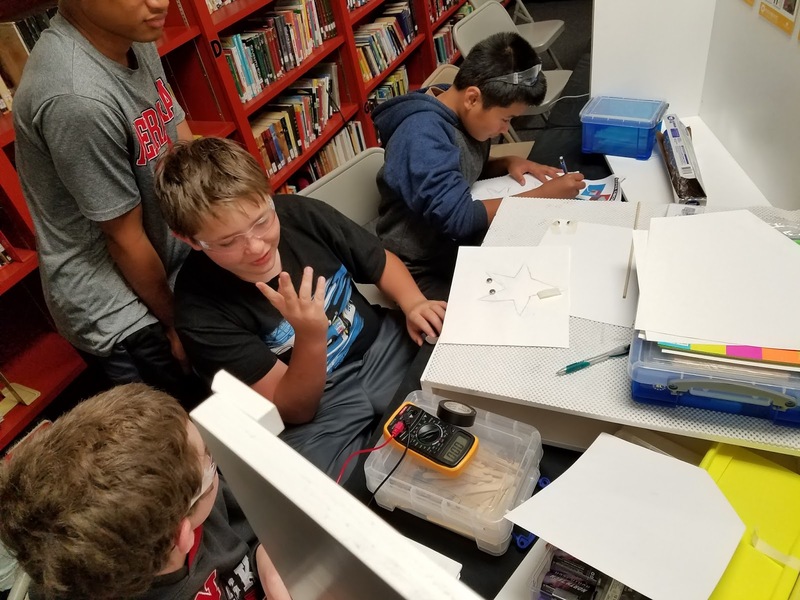 CMS will have the Makerspace labs available for student use until December 16th. We invite parents to stop by and check it out. 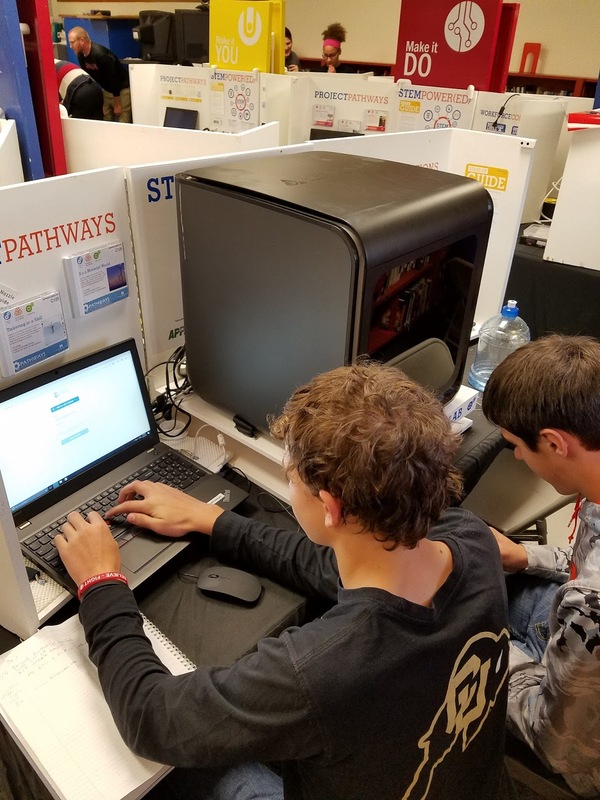 I think that you will be amazed at the technology that students have the opportunity to work with. 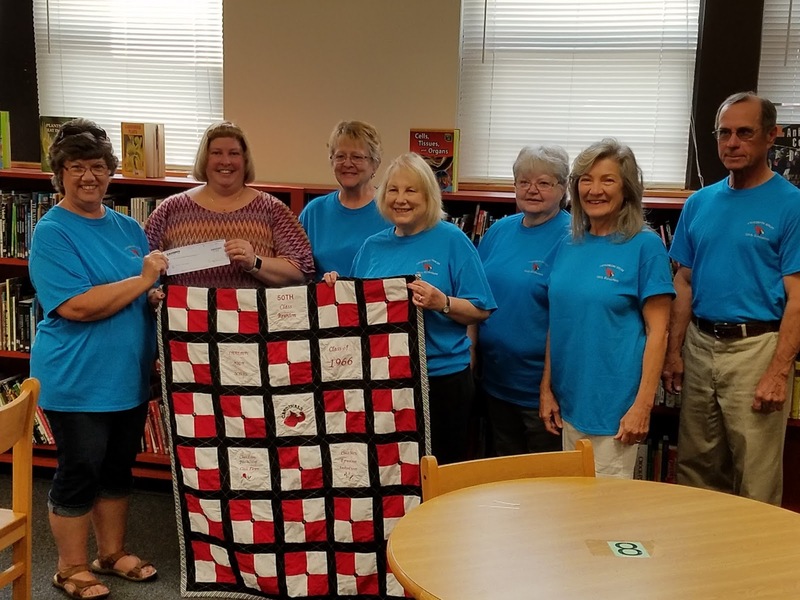 Mrs. Kaus wrote and received a $500 grant from the Western Library System. The grant was written to create a Makerspace lab in the CMS Library. The grant money will be added to the $1300 donation from the Chadron High School class of 1966 to purchase Makerspace furniture and supplies. We are excited to move forward with the CMS Library Makerspace and we look forward to students enjoying the space and seeing them create and explore. I shared an earlier post with the names of the students that won the Upper Niobrara White NRD Poster Contest. Here are the pictures of the students with their award checks and awesome art work! As a reward for their hard work, Mrs. Smith's 8th grade Cardinal Block did the Mannequin Challenge. They did a really good job! Jacki Dailey, from Keep Chadron Beautiful, announced that Chadron Middle School has won the 2016 Recycle Bowl by collecting 2542.6 lbs. of recyclable items! 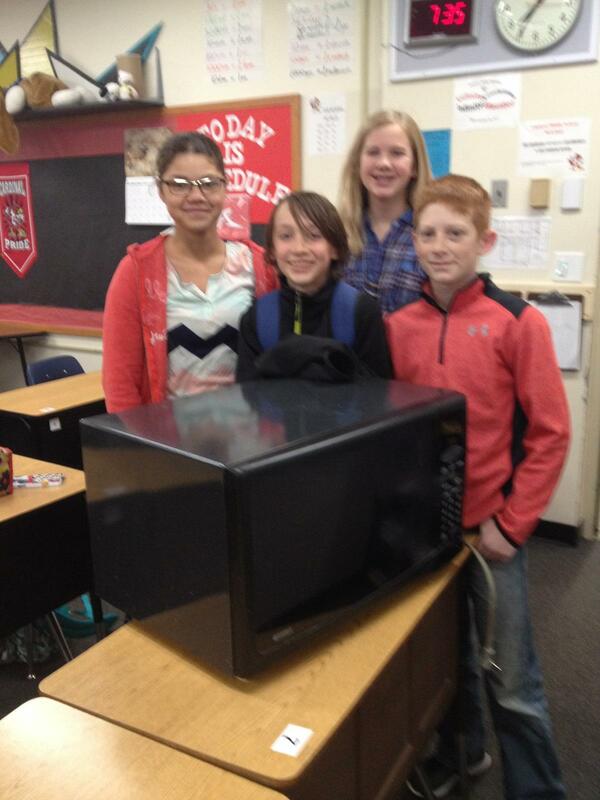 The middle school edged out the Chadron Primary School by just 30 lbs. It is amazing to think that between the two school over 2.5 tons of what would have been landfill trash, was recycled! Thank you to all of the students, families and community members who supported the 2016 Recycle Bowl at all of the schools. Quinton Aaron, the star of the hit movie The Blind Side, spoke to Chadron Public School students on November 14th, 2016. Quinton is the head of the Quinton Aaron Foundation which allows him to bring his anti-bullying message to students across the country. Quinton talked to students in grades 3-8 during the morning program and high school students during the afternoon assembly. 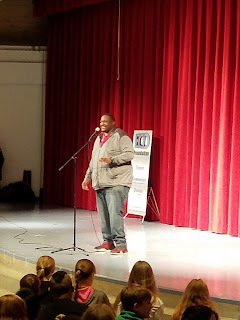 During the program, Quinton weaved his personal story of bulling into a larger message whereby he challenged students to "be nice to each other" and to never give the bully their power. He encouraged students to talk to an adult to if they are being bullied. take place on November 18th and a member of the foundation will contact the winner. Quinton Aaron will wrap up his visit to Chadron with a presentation at Chadron State College on 11/14/16 at 7 PM in the Chicoine Center. Chadron Middle School celebrated Veteran's Day with the community on Friday, November 11th during our annual Veteran's Day Program. 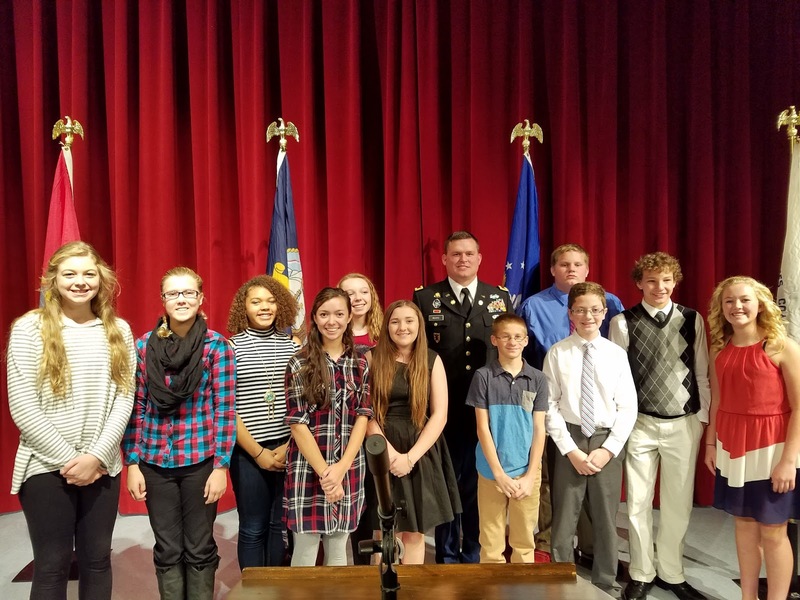 The program was planned and MC'ed by 8th graders in Mrs. Traphagan's 8th grade Social Studies class. 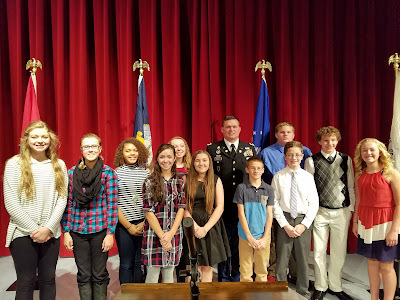 The keynote speaker was Lt. Nathan Reicks who spoke to students about his experiences in Iraq and the why it is important that we continue to honor our veterans. Thank you to Mrs. Traphagan and all of the 8th graders who made the program possible. for a firing tribute and Taps. 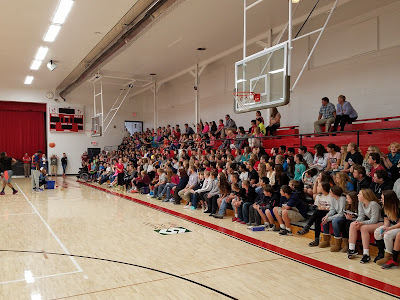 On November 9th, Trooper Chuck Elly (retired) spoke to Chadron Middle School 7th and 8th grade students about sexting, online predators, bullying and cyberbullying. He spoke candidly about the dangerous realities and consequences of these topics while driving home a positive, anti-bullying message. Chadron Middle School thanks Mr. Elly for coming to Chadron and talking to our students about these issues. We encourage parents to talk to their children about what they learned during the presentation and to keep a close eye on their children's online activity. school year and shared a similar presentation with that group of 7th and 8th grade students. 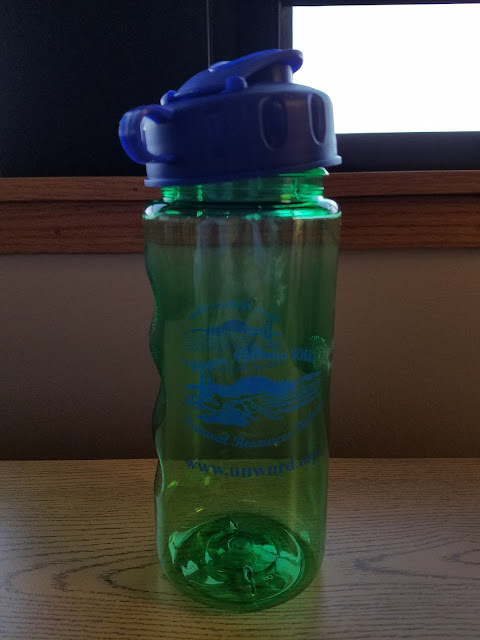 A big thank you to the Upper Niobrara White NRD for the 40 water bottles! They will be given out to students as a part of our Cardinal Pride rewards system. I wanted to inform you about a few assemblies that are coming up during the week of November 7th and November 14th. 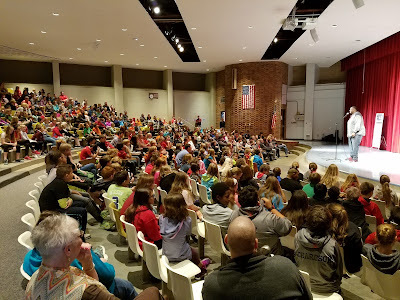 In an effort to protect instructional time, we typically don’t have many assemblies during the school year, however we had the opportunity to bring a couple of outstanding presenters into the school this month and I felt it was a good opportunity for our students. On Wednesday, November 9th, our 7th and 8th grade students will attend a presentation from Trooper Chuck Elly (retired). 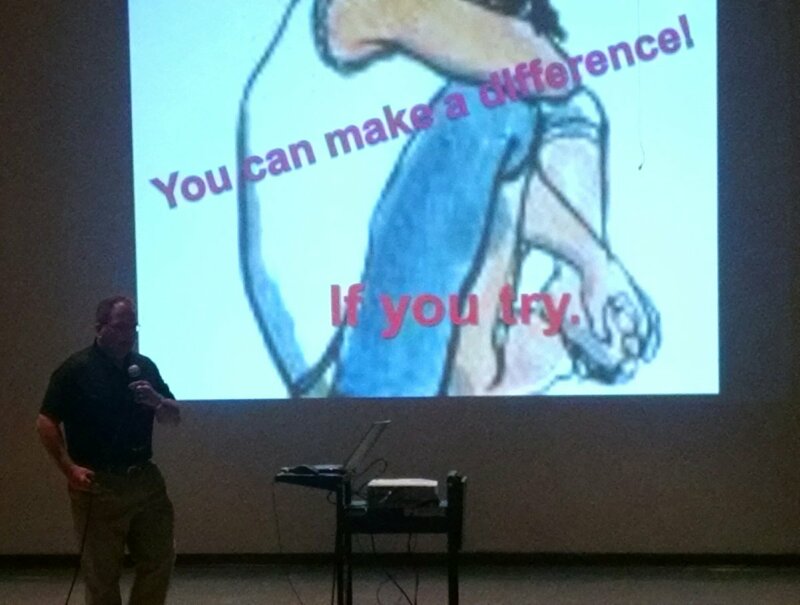 Trooper Elly presented to our 7th and 8th grade students two years ago on cyberbullying, sexting and online predators. He did an amazing job then and will present on the same topics this year. The presentation will be at 10 AM in the CHS auditorium. 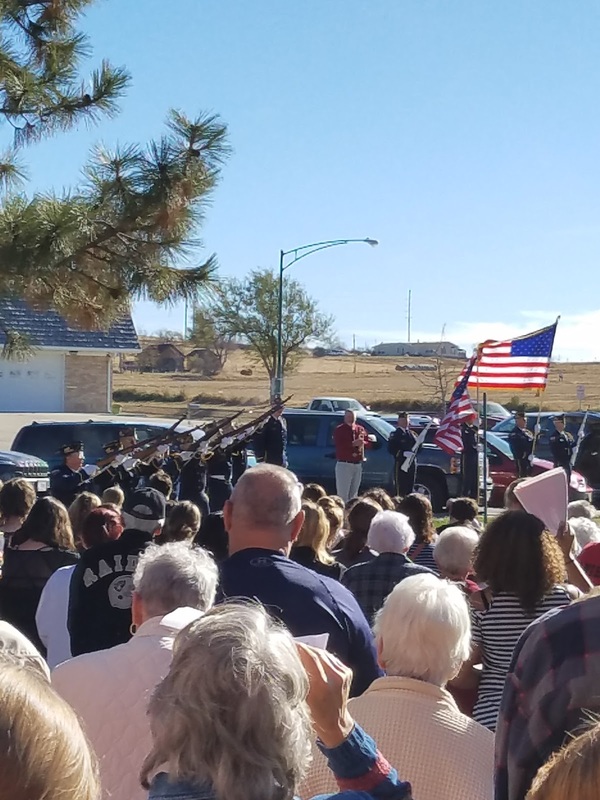 Also, Chadron Middle School will host our annual Veteran’s Day assembly on Friday, November 11th. The program will begin at 10 AM in the CHS auditorium and it is open to the public. As in years past, 8th grade students from Mrs. Traphagan’s social studies class will MC the hour-long assembly. Last, Quinton Aaron, who played “Big Mike” in the movie The Blind Side, will be here on Monday, November 14th to talk to our students about bullying. The 3rd-8th grade presentation will begin at 10 AM in the CHS auditorium. 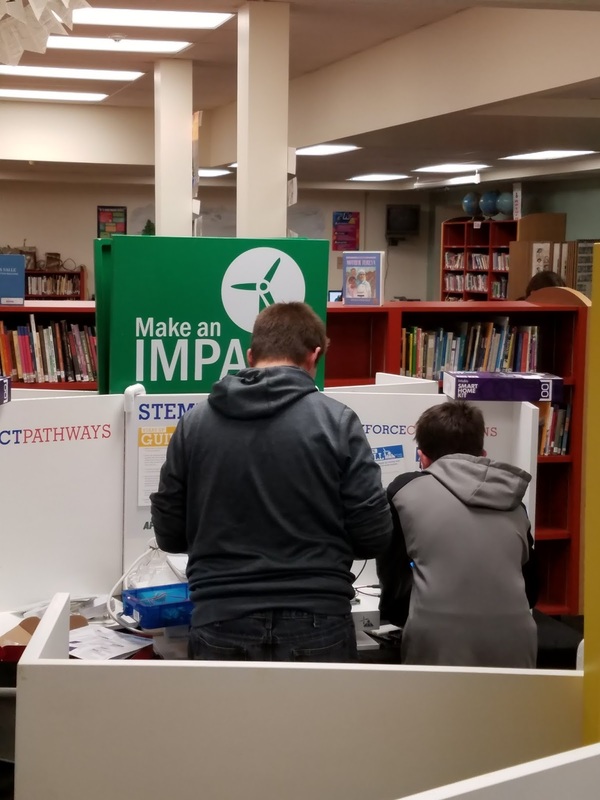 There is no direct cost to the school, however they ask that students try to sell one $10 ticket to help cover travel costs and to support the foundation. Tickets will be entered into a drawing and the winner will win a dinner with Quinton Aaron on Friday, November 18th. Students should bring the money and the ticket stub to the office by Thursday, November 10th. Tickets were sent home with students today (November 7th). 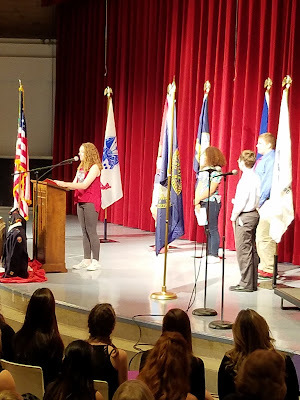 We are excited to provide our students with these opportunities and we encourage parents to talk to their students about what they learned during the assemblies. If you have any questions about any of the upcoming events, please let me know. 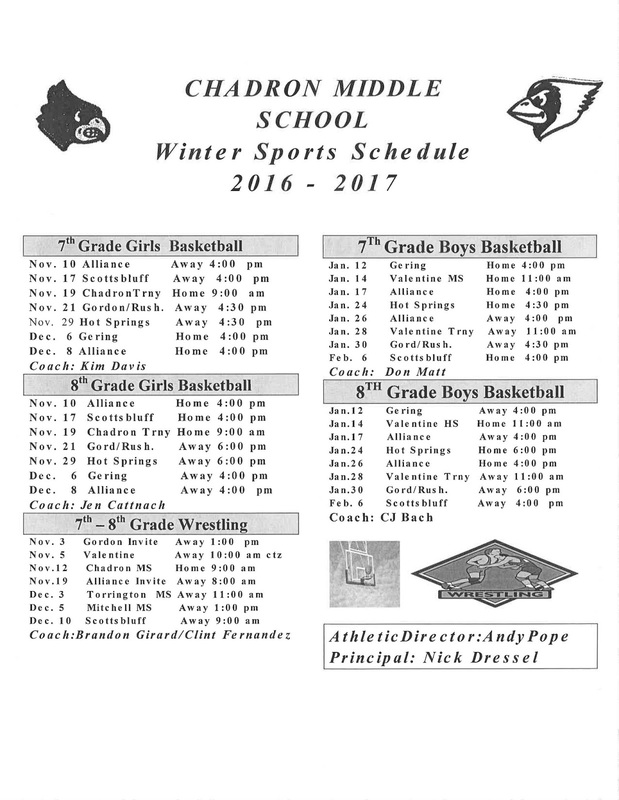 Chadron Middle School wrestlers will not go to the meet in Valentine on November 5th. Instead, they will attend the meet in Scottsbluff on November 5th. The change in schedule is due to Valentine's State Football Playoff game. Chadron Middle School will celebrate Red Ribbon Week during the week of October 31st. The national campaign started in 1988 in response to the 1985 murder of DEA agent Enrique Camarnea. Parents and youth across the country started to wear red ribbons as a way to raise awareness of the murder and to protest the destruction that drug use causes in America. Red Ribbon Week continues in schools and communities across America as a visible commitment to live a safe, healthy and drug free life. In keeping with tradition, part of Chadron Middle School's celebration will include dress up day themes. The 2016 dress up themes are below. 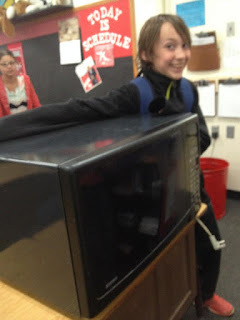 The Chadron Middle School Student Council Lunchroom Committee just made the microwave line shorter by scoring another microwave for the lunchroom. A huge thank you goes out to Parker F. and his family for the generous donation. The Chadron chapter of TEAMMATES will host the "GO BIG" Event on November 9th at 6 PM in the CHS Gym. 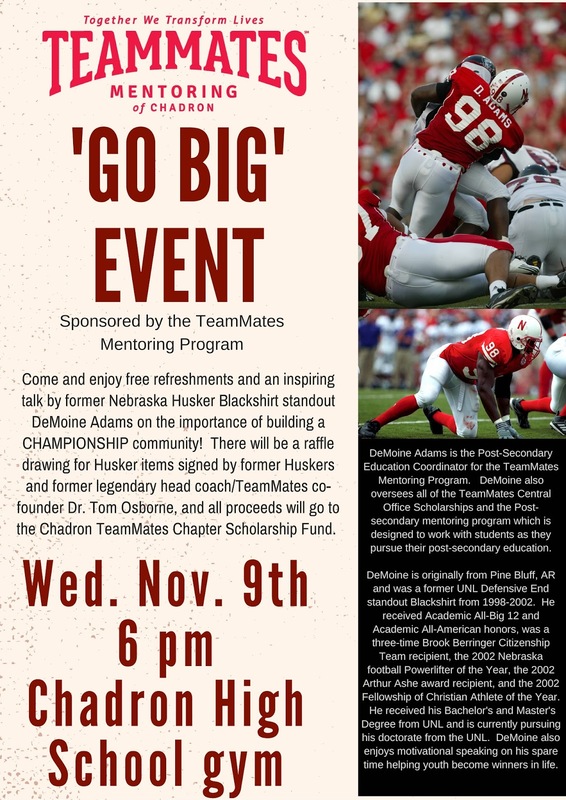 Former Husker Blackshirt, DeMonie Adams, will be the the special guest speaker. Please check out the flyer below for more information. 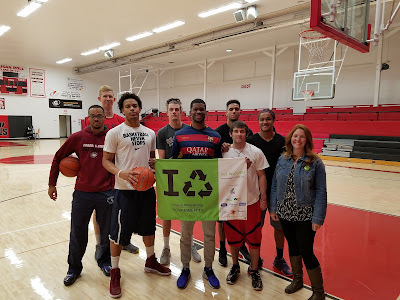 On October 10th, Jacki Dailey from Keep Chadron Beautiful and the Chadron State College Men's Basketball Team, helped kickoff the 3rd annual Recycle Bowl at an all school assembly in the CMS gym. Ms. Dailey explained the Recycle Bowl and informed students of the different kinds of items that can be recycled during the program. Items included plastic, cardboard, paper and aluminum cans. 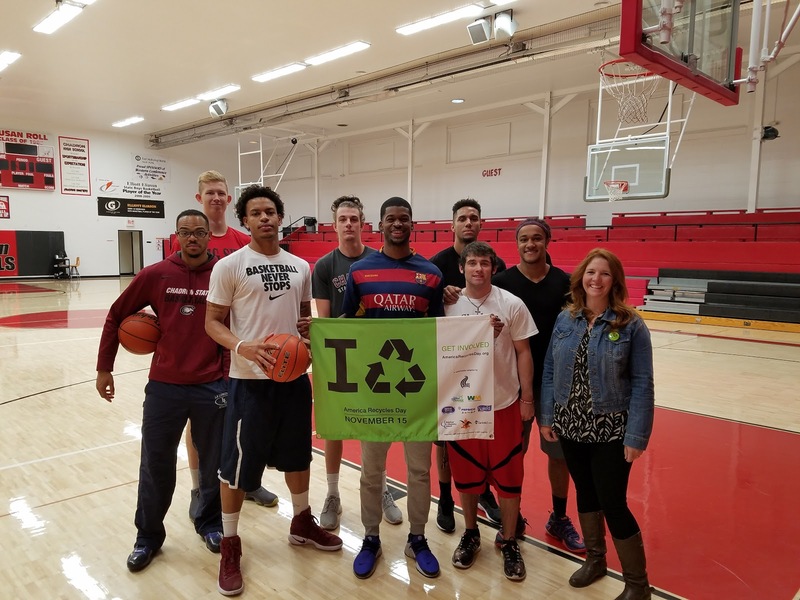 The Chadron State Eagles Men's basketball slam dunked recyclable items and did a great job of getting the kids fired up for the Recycle Bowl. This is a competition, so CMS students have been challenged to collect more pounds of recyclable items than the Primary School and Intermediate Schools. In addition, Ms. Dailey let the kids know that last year the community of Chadron took 1st place among participating communities in Nebraska for collecting the most recyclable items and challenged the students to be 1st in the nation this year. 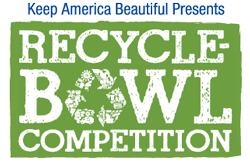 The Recycle Bowl will begin on Monday, October 17th and continue until November 18th. Recycle bins will be placed outside of the CMS playground and students and community members are encouraged to put recyclable items into the bin. Chadron Middle School is pleased to announce the highest NeSA test scores that we have ever posted. 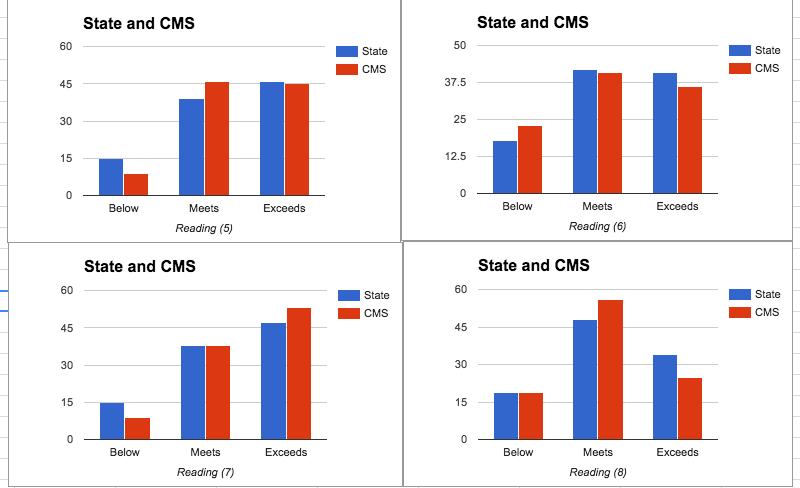 In addition to outstanding NeSA scores, 95% of CMS students met their MAPS growth goals in reading. Our AdvancED goal is to have 100% of students meet proficiency on the NeSA Reading test and/or meet growth goals on MAPS. As you can see, we are off to great start! CMS has much to proud of: 85% of 5th graders meet and/or exceeded standard in Science, 90% of 5th graders and 93% of 7th graders meet and/or exceeded standard in Reading, over 80% of 6th, 7th, and 8th graders meet and/or exceeded standards in Math with 91% of 7th graders meeting and/or exceeding math standards. Our 8th graders demonstrated exceptional growth on NeSA Reading, growing from 69% meeting/exceeding in 2015 to 81% in 2016 and growing in Math from 70% meeting/exceeding in 2015 to 83% in 2016!. We are very proud of our students for their outstanding performance, the effort that they put into their tests, and the hard work that they put into their classes. We are also proud our staff for their hard work and dedication to our students. We recognized that there are still areas that need to be improved and we are working to offer our students opportunities to enhance their skills through enrichment and intervention programs. Below you will find screen shots of how CMS performed compared to the state (CMS is in Red and the state is in Blue). 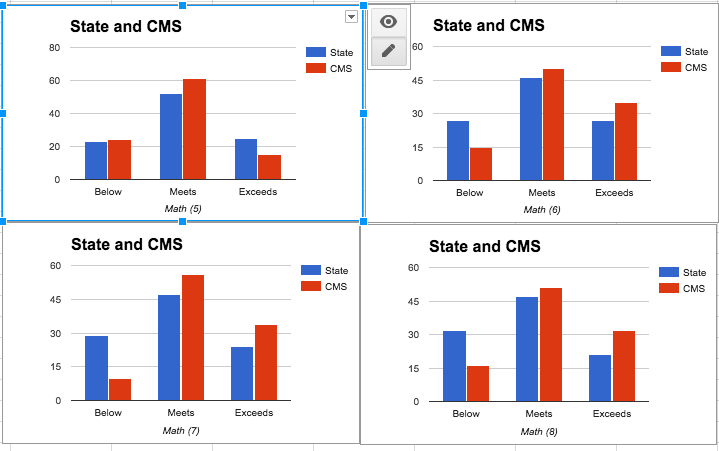 You will see that in nearly all of the tested grade levels and subjects, CMS out performed the state. NeSA Writing - remain embargoed with the state until further notice. This table shows the numbers that correspond with the graphs above. Just a reminder that CMS Parent-Teacher Conferences are this Thursday, September 15th from 2-8 PM in the CMS Gym. CMS, and only CMS, will have a 1:30 dismissal on that day. In an effort to alleviate some of the congestion at conferences we are asking, if possible, that 5th and 7th grade parents come to conferences between 2 PM and 5 PM and 6th and 8th grade parents come to conferences between 5 PM and 8 PM. We understand that some parents have children in different grades at CMS and that work schedules may be not be flexible, so these are only suggested times. All teachers will be available for conferences from 2 PM to 8 PM. The Chadron High School Class of 1966 recently gave a generous donation of $1300 to the CMS Media Center. The donation was made possible through a quilt raffle this took place this summer. 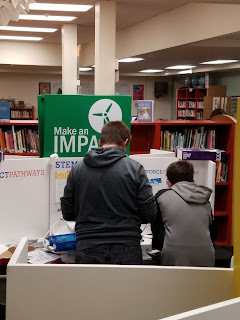 The donation will be used for media center Makerspace furniture. 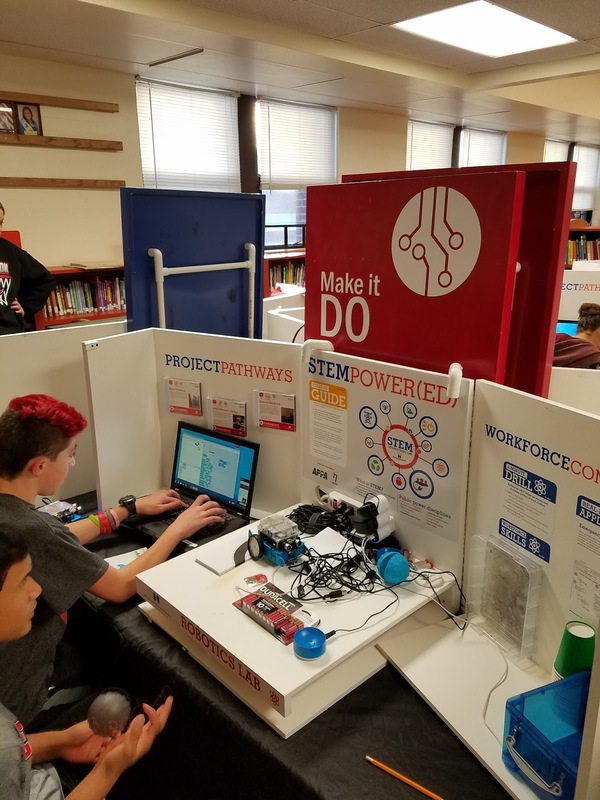 Makerspaces are creative, collaborative, community spaces in a school where students use high-tech and no-tech tools and equipment to create, learn, and explore. Makerspaces in schools are often found in the school's media centers (formerly called libraries) because it is public, common space that all students have access to throughout the school day. 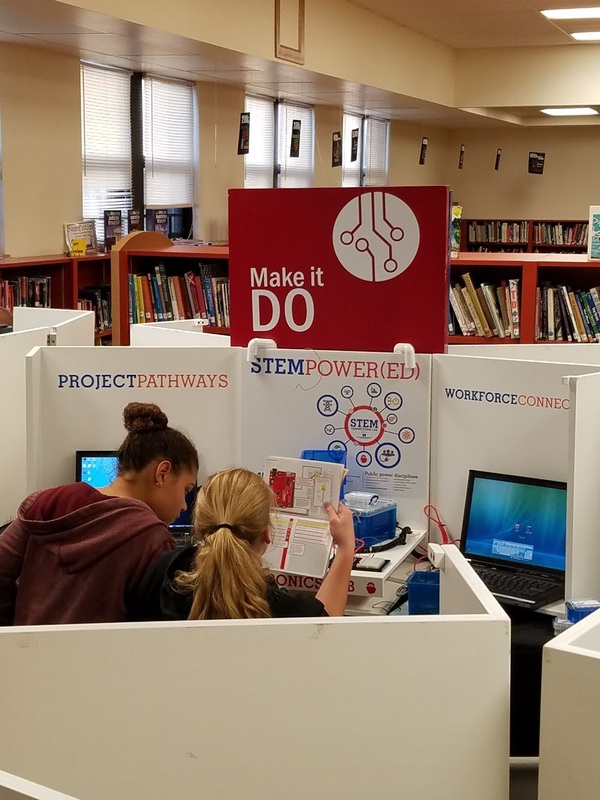 Chadron Middle School is excited to have the opportunity to provide our students with a Makerspace area and we greatly appreciate the generous donation for the Class of '66.